In July 2016, City Council approved the Long-Term Waste Management Strategy. The Strategy is a master plan that guides the City’s implementation of environmentally sustainable, socially acceptable, and cost-effective waste management programs and services over the next 30 to 50 years. The Strategies’ total budget is $144 million over the first ten years ($114 million Capital and $30 million in Operating). The Strategy will be reviewed, revised, and updated every five years, beginning in 2021 and again in 2026. In the new term, City Council will consider a proposal to build a third Anaerobic Digestion Facility and a Mixed Waste Processing Facility, both of which are critical in ensuring ongoing sustainable waste management. City staff have selected a consultant to conduct a study on mixed waste processing with organics recovery. Starting in 2014, the City undertook a comprehensive process supported by widespread public and stakeholder engagement to develop the Long-Term Waste Management Strategy. The process included evaluating policies, programs, technological options, and best practices for new and emerging waste reduction, diversion and disposal methods. The Strategy places priority on maximizing the life of Green Lane Landfill by minimizing the amount of garbage sent for disposal and focusing on the 5Rs (Reduce, Reuse, Recycle, Recover, Residual Disposal). 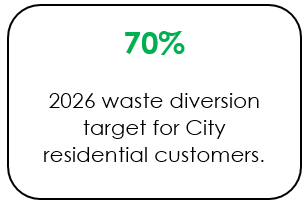 The Waste Strategy identified options specific to the multi-residential customer base to take advantage of opportunities to improve participation, ensure proper use of programs and services and decrease contamination. The City will undertake extensive promotion, education and enforcement to residents, property managers and superintendents to ensure the program is understood and to increase compliance. The City has two organics processing facilities. One of these facilities is currently in the final stages of construction and will be commissioned in March 2019. Once operational, Solid Waste will have a combined internal processing capacity of 130,000 tonnes per year. In addition to its organics processing capacity, the City has also secured several processing contracts with private sector operators to ensure sufficient capacity. The City manages about 160,000 tonnes of organics, and the current mix of internal and external capacity is sufficient to meet current needs. As of 2020, based on the current facilities and private sector contracts, the City will not have sufficient organics processing capacity to manage projected needs. The City is exploring opportunities, including construction of a third organics processing facility, securing additional external capacity, potentially partnering with other municipalities as they also face increasing organics processing demands, and working with the Province of Ontario to ensure consistent requirements around organics diversion. The Waste-Free Ontario Act (WFOA), proclaimed November 2016, replaced the Waste Diversion Act. The WFOA is enabling legislation comprised of two key elements, the Resource Recovery and Circular Economy Act, and the Waste Diversion Transition Act. Together, these Acts were intended to transition waste management within Ontario from a model that placed the onus of materials management and recycling on individual municipalities, to one that emphasizes waste reduction by making producers responsible for the end-of-life management of their products, known as Extended Producer Responsibility (EPR). EPR is also a key principle in the transition towards a Circular Economy, which prioritizes waste prevention to minimize the amount of waste requiring management and moving towards a zero-waste future. It looks beyond a “take-make-dispose” model and aims to redefine growth, focusing on maximizing value and elimination of waste by improving the design of materials, products and business models. The Long-Term Waste Management Strategy includes many initiatives to reduce waste and enhance diversion. In November 2017, the Circular Economy Unit was launched. The unit has received funding to complete testing of coffee pods within the City’s organics processing facility as well as established the “ADAPT” Policy that sets out criteria for how new products are added to the City’s diversion streams.